We're happy to share our website. We'd love your thoughts. You can email us with comments. See photos of the horses Lori helps. See photos showing how taping helps horses. 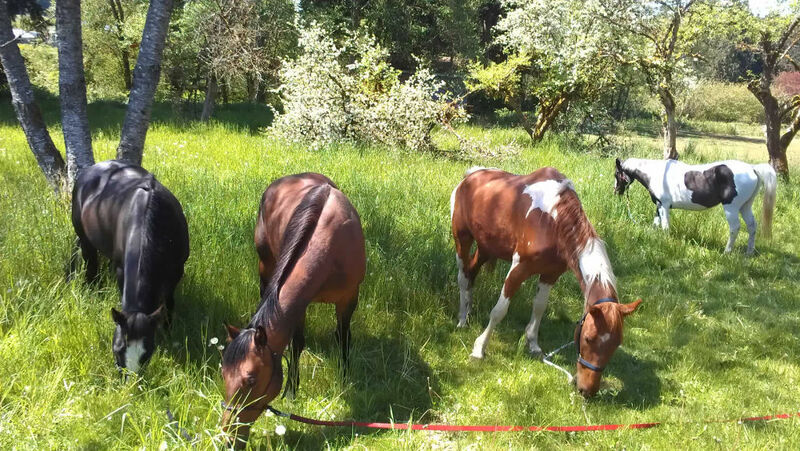 We offer horse massage & bodyworks services in the Snohomish County, WA area by appointment (425-754-6643 or email). For our qualifications, see about. The Horse has a majestic beauty that no other animal can imitate. The way they move, the way they're designed and the way they interact with us and other animals is truly amazing. We come to your facility. We put your horse at ease. We apply the power of touch to comfort, relieve stress, release tension in soft tissue, realign scar tissue, promote circulation and organ support. Also massage and bodywork can help to reabilitate. We're happy to work with other health care providers to get the best outcome for your horse. We'd be happy to talk about these services if they apply to your horse.